Need some last minute ideas for Father's Day? Well, CVS has what you need! We were able to review these amazing new cool cases, just in time for Father's Day. They are so simple to make! Just add your photo to the item you need and you have a fun, personalized gift just for dad! Grandparents LOVE these type of gifts! My in-laws both have cell phones, so the cell phone cases are perfect for them, and keep the grandkids near them even when they live far away. 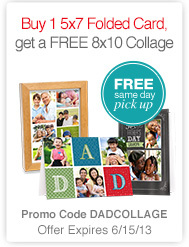 CVS also has a sale for buying 1- 5x7 folded card and get an 8 x 10 collage for free! These are available to be picked up in the store right away, so grab a frame while you are there, and you have a card AND a gift! Don't forget to follow CVS on Facebook to get announcements of all of their deals! MamaBreak received a Kindle case to share with you this great deal! We did not receive any other type of compensation. As always, our opinions and experiences are our own.